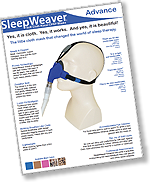 The SleepWeaver ANEW is the first ever non-allergenic and breathable, cloth, full face CPAP mask designed to help people sleep and breathe in comfort. The dual interface design comfortably seals around both the nose and the mouth, with no gaps and only soft cloth touching the skin. The unique “loose fit” seal provides the ultimate in comfort and eliminates strap marks. 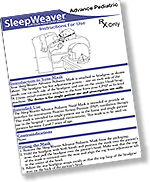 The SleepWeaver Anew is available in multiple size options to ensure that users find the perfect fit for their face. 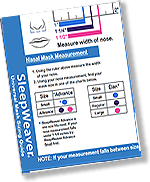 Please follow the sizing guide below as SleepWeaver Mask sizing is different to other masks on the market. If you are between sizes please purchase the smaller sizer. Please note that this mask does not include a CPAP tube extension. I purchased my 1st Anew full face mask December 2017, it was the most comfortable mask to wear compared to most other brands. This year December 2018 I purchased my 2nd Anew face mask. the team at HM are so helpful. I highly recommend the Anew mask. Yeah I'm not so sure. The cloth is certainly more comfortable for side-sleeping than the big and heavy plastic masks I have worn in the past. I have no dints in my face or red marks from the silicon/rubber seal. But I am not convinced by the seal around my face (full face mask), my machine often has a "High Leak!! Adjust Mask!!" message. Also I seem to have a seam right across my top lip which rubs at night and is sore during the day. Response from HomeMed: Hi Damien, Thank you for your review. We suspect you might have a sizing issue, the rubbing is something we have seen before that has instantly been rectified by trying a smaller size. This should also remove any leaking. Please contact us sales@homemed.com.au and we can sort out a solution. I was hoping this cloth mask was going to be my savior, as other silicone or plastic masks tend to irate my face. Alas it was not to be, the mask could use some improvements a small stick like scaffolding around the mouth area would stop the pipe connection from hitting your lips. The nose section could do with a elastic nasal bridge to hug the nose better as that is where it tends to leak. No matter how many times I tried I just could not comfortable with this mask. I did ask for a medium but received a small,maybe that why it so uncomfortable.